As much as I try to shy away from using cliches, it is true that all good things, especially the availability of seasonal fruits, come to an end. Summer to me, and most from the Indian sub-continent, is synonymous with one fruit – the mango. Actually, many types of mangoes, from varieties that start as soon as spring ends to those that continue to appear in produce markets until the middle of the monsoons. 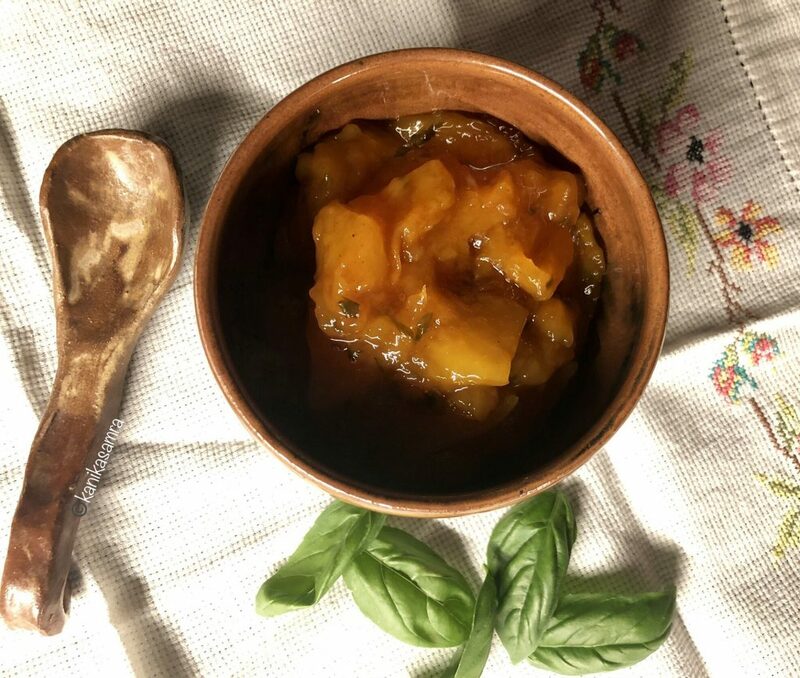 Mango Basil Chutney – Bottling up the flavours of Summer! 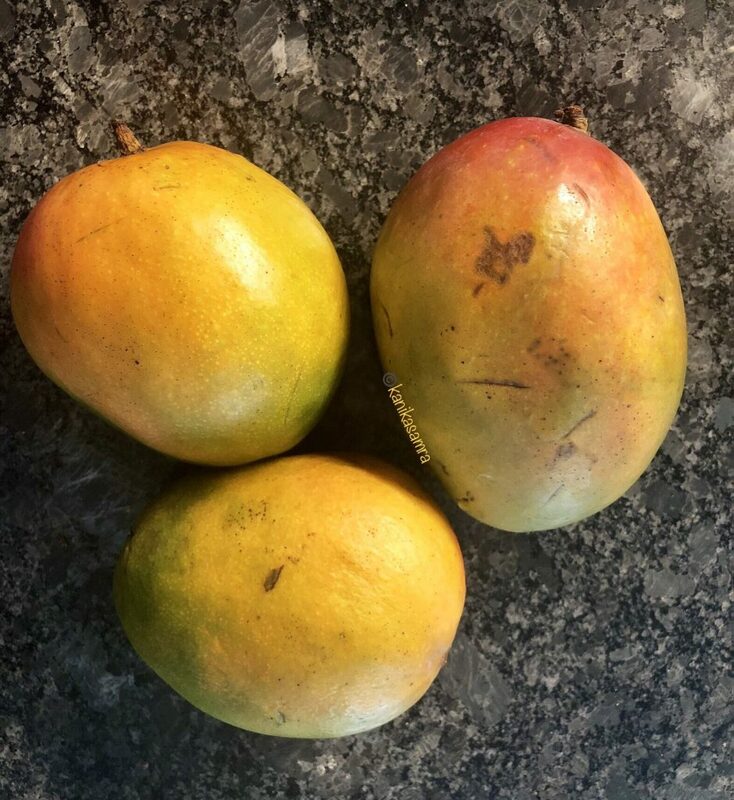 So, then the obvious question is – how do I prolong the pleasure of fresh mangoes? There are a few methods from flash freezing to cooking in various ways. While cooking is not fool-proof, I am partial to making chutneys because we are a household of chattoras! Chattora in Hindi is someone who loves food with a blend of spicy, sweet and savoury flavours. A great example is chaat – whether made with potatoes like Aloo Chaat or with gol guppe like this Chaat hors d’oeuvre. 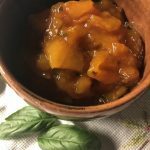 Cooking a chutney or compote does require additional sugar and salt but this method of preservation helps lengthen the life of seasonal fruits and vegetables. A properly canned preserve can be kept for up to a year bridging the time between consecutive seasons. 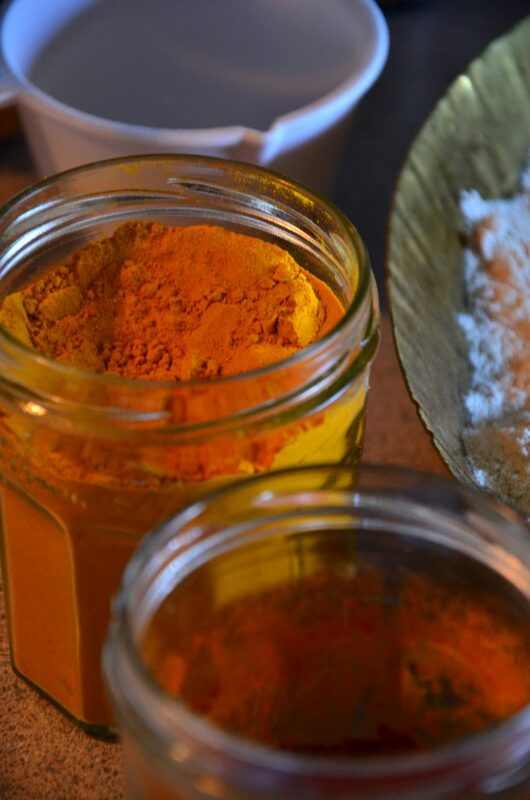 Before I move on, just to clarify, you can also make a chutney without cooking Mangoes – like this Raw Mango Chutney. But to store it longer cooking is the way to go. The recipe for my Mango Basil Chutney yields a chunky preserve that can be kept for longer. I cooked only enough to enjoy for a couple of weeks, and needless to say will be cooking more before the mangoes disappear. Which mangoes to use for the Mango Basil Chutney? If you live in India or another tropical country with a wide variety of mangoes, you will be spoilt for choice. Sakshi, our blogger from Dubai, shared her experience of buying mangoes in UAE in her recent write-up. Her informative post highlights how geography and diplomacy play crucial roles in the availability of mangoes. The debate about which region is the best for mangoes has long been settled – hands down it is India. The country has so many varieties, running in to the hundreds, that often Indians travelling within the country also find themselves encountering an unknown variety with a different flavour profile. Yet, they rarely make an appearance in American supermarkets. This is the legacy of a long-lasting ban on importing mangoes from India for fear of pests. The import ban was lifted in 2007, but the rigorous screening by USDA has resulted in sky-high prices and delays that often results in the arrival of overripe fruit. Having lived in America for many years, I had never had Indian mangoes until this year when we ordered two cases from a fruit importer. We got two kinds – Langra mangoes that are native to the northern plains, especially in the state of Uttar Pradesh and Kesar, which are grown in Gujarat. They were delicious and the excitement was REAL! (See the Instagram post below) But at the exorbitant rate at which they are sold, almost $7 a piece, it is a luxurious indulgence. Tommy Atkins: Fleshy, large and reddish when ripe. Each mango can weigh anywhere between 12 to 24 ounces i.e. up to ~ 500 gms. The cultivar was grafted in Flroida but today most of these are imported from central America. Ataulfo/Champagne: Slender and flute like, these mangoes are a deep yellow when ripe. They are imported from Mexico. Keitt: A late season mango, with little fibre. Can be very large and heavy, but remain green even when ripe. Haden: This is the main cultivar for most commercial varieties in USA. Tommy Atkins and Glen are supposedly descendants of Haden (according to Wikipedia). I have to feign ignorance, since I haven’t even see this in a store! These fleshy mangoes are actually not as fibrous as most writers describe. I have found over many seasons that if the mangoes are allowed to ripen for a few days at room temperature, they present a good balance of sweetness and tartness. Smell the mango. It should be aromatic. (If you spot me in a grocery store sniffing fruits – that’s what I am doing! It works for all fruits). Touch the top, near the stem and the bottom tip where the mango curves into a tip. These points should be soft and depress easily. The Ataulfo, on the other hand, are a hit and miss. A ripe Ataulfo is typically yellow and soft to touch. But this can be misleading. I have cut into fragrant Ataulfo to find unripe, hard flesh inside and at other times even a day between buying and eating can lead to over ripening and an alcoholic taste due to the high level of ethanol. Inactive: 15 minutes, Active: 30-45 minutes. To begin, wash and pat dry mangoes and basil leaves. Then peel and cube the mangoes. Roll basil leaves and then finely chop them. Put a heavy bottomed saucepan on the stove. To this add sugar and lime juice and cook together on medium heat until the sugar dissolves and forms a thick syrup. *Note: If you are out of limes or lemons, use vinegar. Next, add mangoes. Then add salt, chilli powder and black pepper and mix well. Continue to cook on medium high heat until the mangoes start softening – about 10 minutes. If the mangoes you are using aren’t entirely ripe, then the cooking time will be longer. Finally, add basil and mix. Reduce the heat to medium and stir the chutney. After another 5 minutes, reduce the heat to low and simmer covered for 15 minutes. Stir in between to make sure nothing stick to the bottom of the pan. At the end you should see the chutney thicken and mango pieces soften and mash easily. Let the chutney cool before canning. I did not use canning tools. Instead, I re-used a glass jar that had once held something else. Washed it in the dishwasher so that it was sanitized. I made sure, and so should you, that the jar is dry before transferring chutney for storing. Since I made a small batch, it went straight into the fridge. I made the chutney about 10 days ago and it’s still doing well. If like me you do not have the right gear for canning, I recommend following fellow blogger, Anita’s advice. She recommends using a little piece of cling film on top before closing the lid. Read her post here. 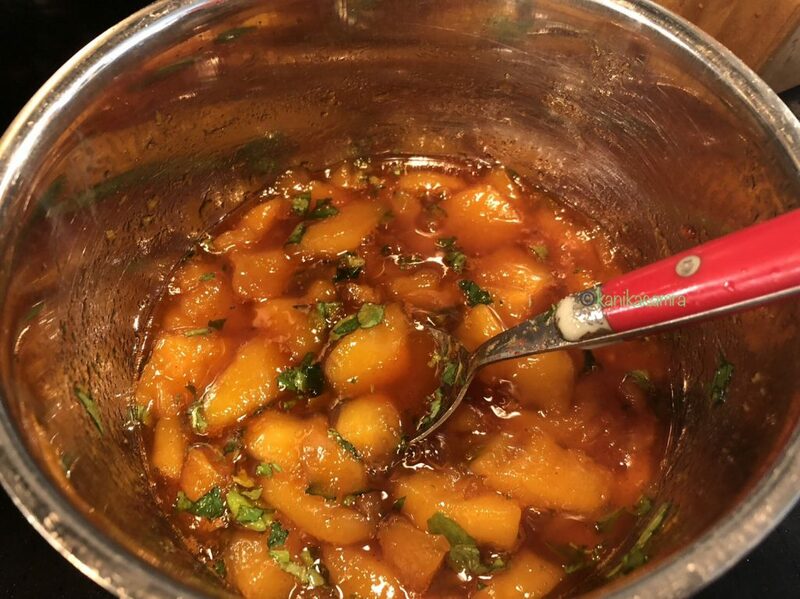 If you want to make a chutney with larger batch of mangoes, just multiply the quantities and make sure you can them well. If there is any doubt about your canning process, refrigerate the preserve, use it and share with friends and family. Mango Basil Chutney – A Dip, Jam and a Chutney! Enjoy this refreshing chutney with crackers, pita, your favourite bread or as a part of your Indian meal. 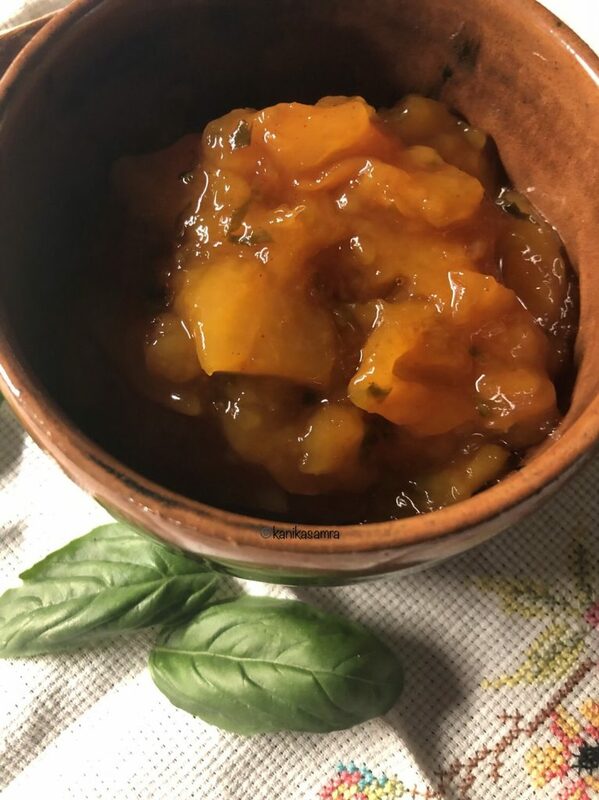 Preserving the flavours of summer - this Mango and Basil Chutney is refreshingly sweet, savoury and salty. Then peel and cube the mangoes. Roll basil leaves and then finely chop them. Put a heavy bottomed saucepan on the stove. To this add sugar and lime juice and cook together on medium heat until the sugar dissolves and forms a thick syrup. Then add salt, chilli powder and black pepper and mix well. Continue to cook on medium high heat until the mangoes start softening – about 10 minutes. Finally, add basil and mix. Reduce the heat to medium and stir the chutney. After another 5 minutes, reduce the heat to low and simmer covered for 15 minutes. Stir in between to make sure nothing stick to the bottom of the pan. Let the chutney cool before canning. If you are out of limes or lemons, use vinegar.